YG Entertainment is making headlines due to a controversy regarding additional construction to their Seoul headquarters in the Hapjeong neighborhood. 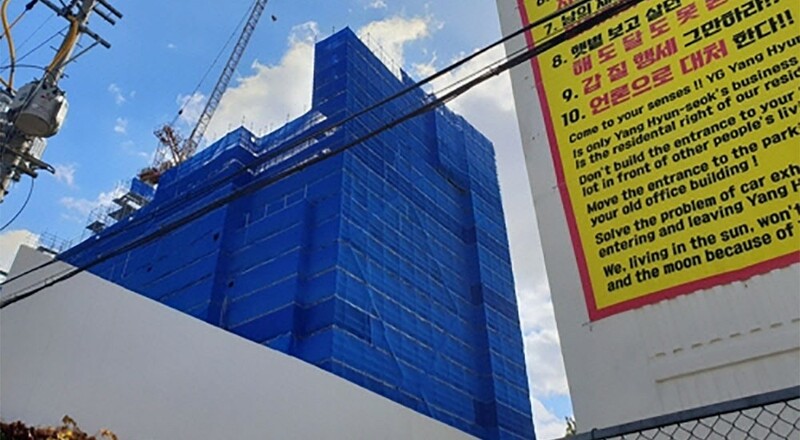 According to Yonhap News, residents living in apartments nearby the YG Entertainment building are filing a complaint, stating that renovations made to the building will be violating their 'right to sunshine,' a basic right protected under local construction laws. The YG building, whose construction is scheduled for completion in mid-2019, will be gaining additional floors that will make it roughly one and a half times larger than any nearby apartment. The construction has already begun to block sunshine from apartment complexes east of the building. Local neighbors have complained that this increasingly limited access to natural sunlight has been making their apartment buildings colder and beginning to kill plants on the property. The high senior citizen population of these buildings has also made the dropping temperature a cause for concern. However, the Mapo District Office says that the YG Entertainment construction does not violate any laws, as the 'right to sunshine' complaint is only observed when buildings are compromising those south of them. Since the apartment complexes filing complaints are east of the building, there is legally nothing they can do. Meanwhile, residents have been holding a protest rally in front of the YG Entertainment building since October 22. They plan to continue rallies for the time being, demanding both corrective measures and compensation. When approached by the media about this controversy, a representative for YG Entertainment stated: "We have seen the banners of the residents' protest." However, no additional comment was made. YG seems so unbothered in that statement LMFAO! I am sure YG went through all the paper work before increasing their building and the project has already started. They should complain to the government, not towards a company that went through regulations before spending millions of won to expand. Do people really think someone that spends that much money is going to suddenly erase it all? The naivety and self-entitlement in Korea is really something else. If they were building on national land I would be on their side. But nah, they got their permit so that is just tough luck for them.